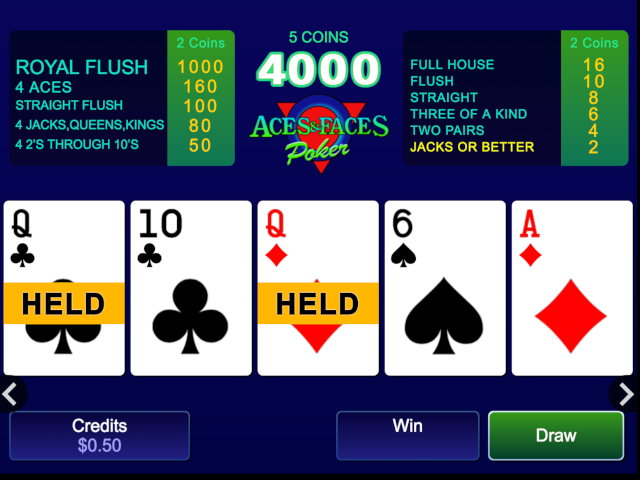 If you’re looking for a new, fun, and exciting way to play poker online, you’ve got to check out Aces & Faces, available through Spin Palace Casino. With a unique style of game play, good payouts, and an easy to understand layout and card combination scale, this is going to be your go to game for online poker entertainment. The object of this game, like regular poker, is to beat the dealer (or in this case, the machine) by scoring a better hand. The game makes use of the standard deck of 52 playing cards, and there are no wild cards. The player must try and use all the cards in their hand to make the highest ranking poker hand possible. The paying ranks goes worst to best, Jacks or better, two pair, three of a kind, a straight (example: 23456), a flush (all same suit cards like all spades or all hearts), full house (a pair and a 3 of a kind at once) which are followed by more complicated combinations like 4 of a kind (only 2s through 10s and face cards apply), a straight flush, four of a kind aces, and finally, the infamous Royal Flush(10, Jack, Queen, King, Ace). You’re allowed to discard and draw up to 5 cards if you need to. The max payout you can get is 4 000 coins at one time. The reason it gets its name is because this game specifically caters high payouts to a combination of the ace cards and face cards. Your face cards count as your Jacks, Queens and Kings still. The lowest possible payout hand you can get is a pair of jacks, which will give pay 1 to 1 for whatever you bet. For example, if you were to bet one coin and received Jacks, you’d receive one in return for the payout. The payout chain keeps true to this patter as you get better hands, so if you get two pairs and bet 1 coin, you receive two, three of a kind receives three and so on and so on until you reach the Royal Flush. That monstrous hand pays out at 1 000 to 1! Poker has a variety of different formats. Some of them are fairly new, and some of them have been around forever, and online poker has them all. One of the things that make this particular format of poker unique is the unconventional payout process. It becomes a more challenging and fun game to play when you’re trying to produce the ultimate combination and beat out the dealer. If you’re an avid poker player or completely new to the game, this is the one that you’re going to have to play for yourself! Download and play Aces and Faces today.